Sun., July 30, 2017, 10:05 p.m.
Kyle Busch used a bump-and-run on Kevin Harvick to take the lead and held on to snap a 36-race losing streak and win the NASCAR Cup race at Pocono Raceway in Long Pond, Pennsylvania, on Sunday. Busch won for the first time this season in the No. 18 Toyota and for the first time ever at Pocono. Busch had led more than 1,000 laps this season entering the race. He was racing for the lead last weekend in the Brickyard 400 when he wrecked with Martin Truex Jr., which led to a pit road altercation between members of both teams. 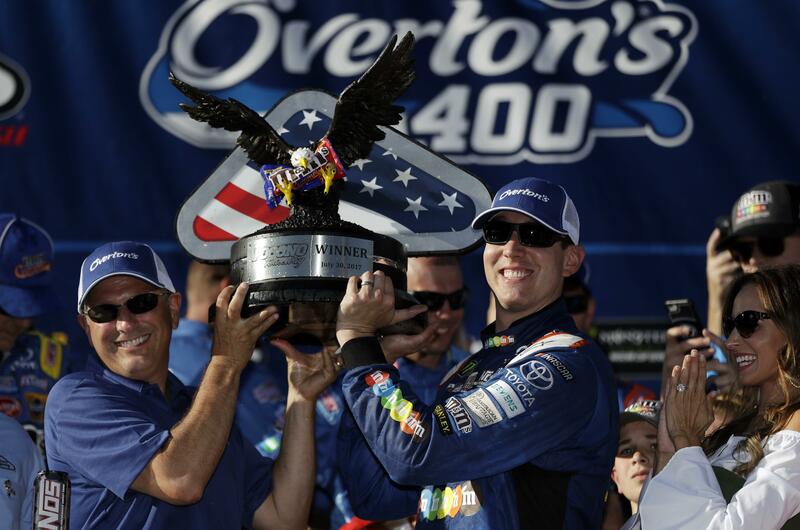 Busch won from the pole and gave Toyota its 100th Cup win since its 2007 debut. Busch, the 2015 Cup champion, had never gone a full season without winning a race. Charlotte Motor Speedway is now the only track where he’s failed to win. He also won his 176th career NASCAR race over the Cup, Xfinity and Truck series. Josef Newgarden dominated at the Mid-Ohio Sports Car Course on the way to his second straight IndyCar victory at the Honda Indy 200 in Lexington, Ohio. Newgarden was not challenged most of the day on the 90-lap, 2.2-mile course and finished 5.156 seconds ahead of Team Penske teammate Will Power, the pole-sitter. Newgarden won at Toronto on July 16 and has six career wins, three this season. Local favorite Graham Rahal was third and 2016 champion Simon Pagenaud finished fourth. Newgarden showed his intentions early when he made an inside pass on Power on the 14th lap. Rahal took a temporary lead when Newgarden pitted on lap 41 but when Rahal went in the next time around, Newgarden went to the front. By lap 50, the Tennessee native had extended his lead over Power to 6.5 seconds. Ferrari’s Sebastian Vettel overcame steering difficulties to win a tense Hungarian Grand Prix in Budapest and extend his championship lead over rival Lewis Hamilton heading into the summer break. Vettel picked up his 46th career win, while Raikkonen expertly defended his position for a Ferrari 1-2. Raikkonen used all of his experience to fend off Hamilton, who eventually finished fourth behind Mercedes teammate Valtteri Bottas. J.R. Todd became the first black winner in NHRA Funny Car history, beating Tim Wilkerson in the Sonoma Nationals at Sonoma, California. The 35-year-old Todd, from Lawrenceburg, Indiana, also joined Don Prudhomme as the only NHRA drivers to win at Sonoma Raceway in both nitro categories. Todd won nine times in Top Fuel. Steve Torrence raced to his sixth Top Fuel victory of the season, Tanner Gray topped the Pro Stock field for his third win in his rookie season, and LE Tonglet took his fifth Pro Stock Motorcycle victory of the year. Published: July 30, 2017, 10:05 p.m.